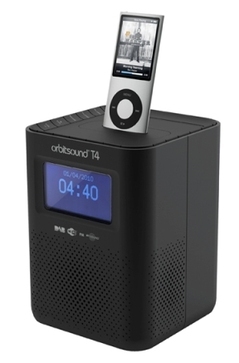 At first glance, the T4 Radiopod appears much like any other internet / DAB / FM radio. At 109x109x143mm it’s quite dinky, with a square black design that’s more subtle than edgy, and the device features an iPod dock in case you want to take charge of the tunes. So far, so standard. But the point at which Orbitsound aims to differentiate itself is with the sound quality: the company claims that its own spatial stereo technology produces a superior audio experience throughout your room, wherever you’re standing (unlike traditional stereo, which only works best in the ‘sweet spot’). We had a play to see if it lived up to the hype. Set up was fairly straightforward, although we reckon the interface could be a tiny bit more user friendly – using the back, forward and select buttons to scroll around and input your wireless network key is a bit fiddly. But once you’ve got to the main menu, it’s not difficult to find your way around the internet, DAB, FM and iPod options. And so we arrive at the spatial stereo technology. Having already tested the portable T3 speaker in the past (which hangs around your neck on a lanyard, creating quite an impressive ‘halo’ of sound), my hopes were fairly high. And, I’ve got to say, they weren’t disappointed. The T4 packs quite a lot of power, and delivers a solid, consistent sound around the room. We had a better experience with the DAB stations than the internet radio, but both sounded good throughout Shiny Towers. You’ve got 10 DAB and FM presets to play with, and over 10,000 internet stations and podcasts to hand. Again, the user interface meant that browsing for podcasts by genre is a bit fiddly: you can either look through a long, alphabetical list (which means that, if you’re looking for things literature, politics or sport, you might be clicking away for a while) or use the search function, which isn’t much easier and occasionally throws up some curve balls. But once you’ve got where you want to be, the experience is much nicer than listening to podcasts through comparatively tinny laptop speakers. We confess, we were a bit sad to see that the T4 isn’t compatible with iPhone yet. And at £180, it’s not cheap. But it’s a nice bit of kit, and a good way to enjoy decent sound quality in an easily portable device. For more information, visit www.orbitsound.com.